Several months before novelist Howard Frank Mosher turned sixty-five, he learned that he had prostate cancer. Following forty-six intensive radiation treatments, Mosher set out alone in his twenty-year-old Chevy Celebrity on a monumental road trip and book tour across twenty-first-century America. 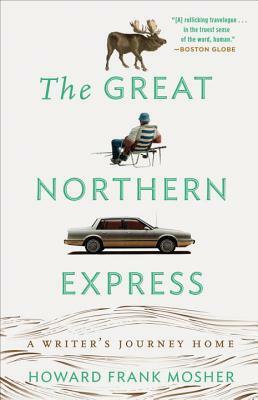 From a chance meeting with an angry moose in northern New England to late-night walks on the wildest sides of America's largest cities, The Great Northern Express chronicles Mosher's escapades with an astonishing array of erudite bibliophiles, homeless hitchhikers, country crooners and strippers, and aspiring writers of all circumstances. Full of high and low comedy and rollicking adventures, this is part travel memoir, part autobiography, and pure, anarchic fun. From coast to coast and border to border, this unforgettable adventure of a top-notch American writer demonstrates that, sometimes, in order to know who we truly are, we must turn the wheel towards home. HOWARD FRANK MOSHER is the author of ten novels and two memoirs. He was honored with the New England Independent Booksellers Association's President's Award for Lifetime Achievement in the Arts and is the recipient of the Literature Award bestowed by the American Academy of Arts and Letters. He lives in Vermont. "Mosher colorfully weaves stories...to create a brilliantly vibrant quilt that covers us with his warmth, humor, and love of discovery, reading, and writing." "Whimsical....Mosher provides a genial reminder that adventures are possible at any age."